Well she’s turning 3 in February. And well….. nothing has changed in that department. But honestly, guys, she’s just as much Mommy’s Girl when no one is looking. Bahahaha how sad do I sound?! No really, guys, she really loves me. I SWEAR. Every morning, she still comes and disturbs me when I put on my makeup. She can talk really well now so it’s so cute because she gets excited and asks you the most obvious things. When I put on my makeup, “Mommy put on make-up?” she asks me. When I say yes, she’ll say “Ohhhh Mommy put on make-up. Nice, Mommy.” – she’s such a fan, guys. When I’m eating, “Mommy eating?” she asks me. When I say yes, she’ll say, “Ohhhh Mommy eating. 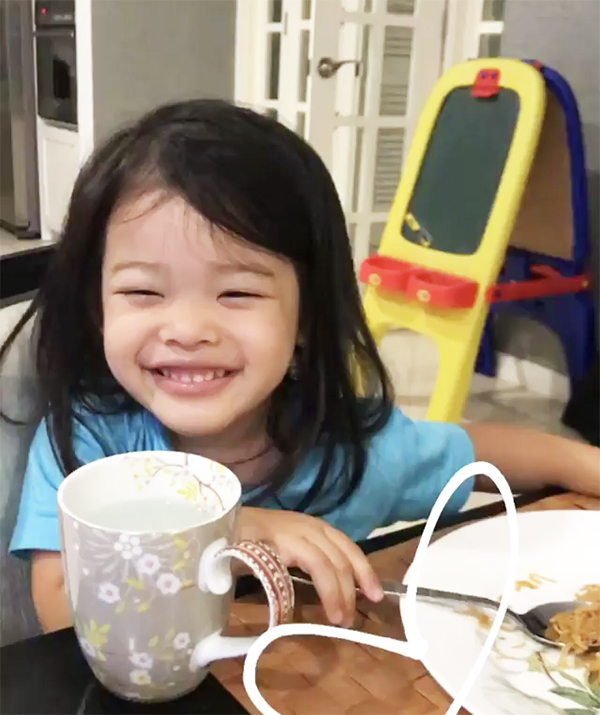 Nice, Mommy?” and then of course that chubby little thing will come to my lap and finish whatever I’m eating – especially if it’s something super yummy and limited edition – like keropok lekor or harummanis mango that you just can’t find anywhere. At the same time, she’s very self-sufficient. She doesn’t like to share or play with others (sounds familiar….) so she plays by herself a lot. She had a doll she really loved (she’s bored of it now… also familiar) and she’d talk to the doll, but their conversations are superrrrr boring. “Hi doll, you want to shower? No? Okay. You want to poopoo? No? Okay. You want to sleep? No? Okay,” she’ll have a monologue but she looks so serious while talking to the doll you really don’t want to interrupt “their” conversation. 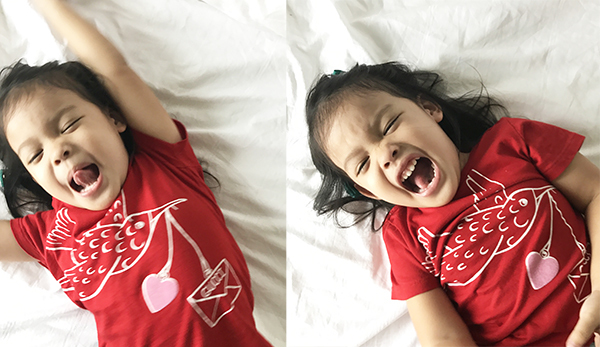 Even though Daniel is the elder one, she can be such a kakak sometimes. When Daniel does something wrong and we scold him, she’ll go to him and say “Don’t do anymore ok, Daniel?” And when Daniel isn’t listening to us and we tell him listen or else we’re taking the TV away, she’ll remind him, “Be quiet Daniel, later cannot watch TV, ok?” I’m trying to make sure their manners is there, so saying thank you is crucial everytime I give something. Daniel can’t care less sometimes so Mariam will look at him, “Hey, say thank you Daniel, say thank you. Ok good boy, Daniel.” Followed by Daniel rolling his eyes at her. The other day she scolded a zebra fighting on a TV documentary, she shook her head and said, “Stop it zebra, naught zebra!” to the TV. I’m pretty sure the zebra rolled her eyes too. She even outsmarts me sometimes! The other day, I had an AVA sleepover to celebrate before Mimak’s wedding remember? And while I was packing, making sure I have all the comfy clothes and sombrero hat all packed, Daniel came up to me. “Mommy, can I come?” he asks. “Awww I wish you could, Daniel, but I’m only going for one night ok. Very fast! Plus, it’s only for girls.” I answered. Mariam peeks her head in from nowhere, “I’m a girl….” She says pointing to herself. Sighhh my sweet sweet baby Mariam. She’s at such a fun age right now that she can talk and she still wants to be cuddled and carried. Maryam is 2 plus and Daniel is 5? She’s tall for her age and that doesn’t come from her Mommy’s gene. Hehehe… You have wonderful children Vivy. Beautiful Mariam! And I really love watching her videos and also the instastories! no! trust me they will still be the cutest thing. Until… 7 ? haha. mann. this just heartbreaking for me. My baby aka my sistah already 7 now. shes so grown up. cry a river.. but sometimes , i can still see the cuteness in her that she used to have. makin dorang besar, less scolding, thats how they’ll stay manja. If you want la.haha.and yes, I learnt it from a very hard way. but Atleast, I succeed ! now who’s with me? Im so touch. Good girl marim. They’ll still be cute up till 11 or 12. Don’t worry, you still have a good 8-9 years. They stop being cute once puberty hits; it’ll come in like a wrecking ball. I still cry every time my 15 year old brother doesn’t want to kiss or hug me anymore. I’m 28.